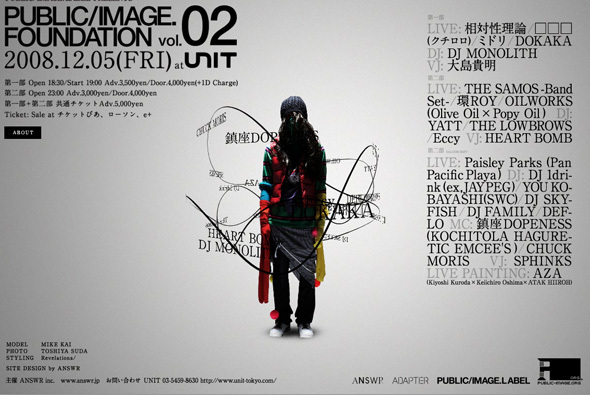 December | 2008 | NICE! 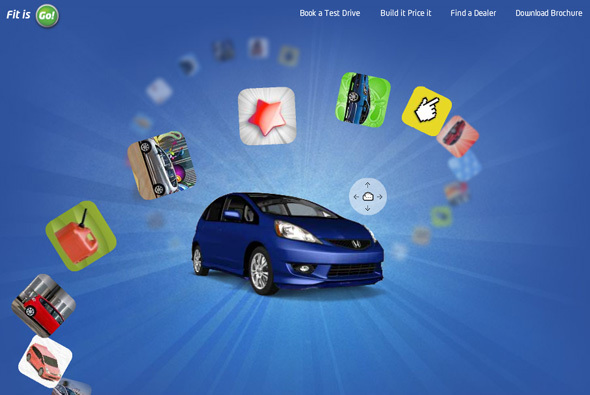 Fantastic site promoting the Honda FIT. Very cool interface, with a the car centre stage, you click and drag the car around and the thumbnails which float around the car in 3D space move so you can select them. Each section features something different, some with little games or images, each highlighting different features of the car. It’s a really fun colourful site, with a really nice use of 3D – which is followed through to the information sections – which is actually quite good fun. I like that you have to explore to get to the various sections – as they are fun you want to see most of them. Love the floating thumbnails and the great feeling of depth in the site, awesome. 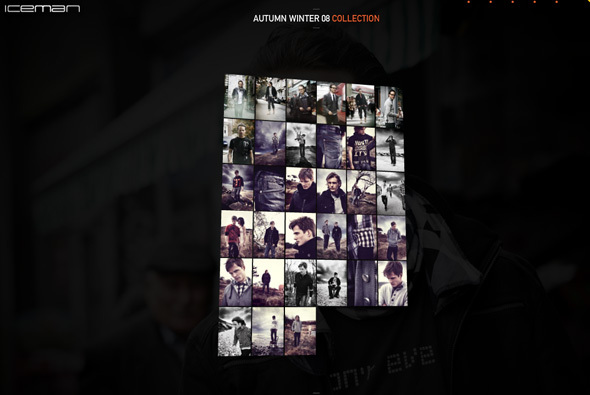 Website of Iceman denim of Denmark. What makes this different is the mechanism of viewing the products in the collection, it’s in 3D and and you can tilt/move your view – to see the next image you grab and ‘flip’ the photo – viola the image flips and the next one flips into view. 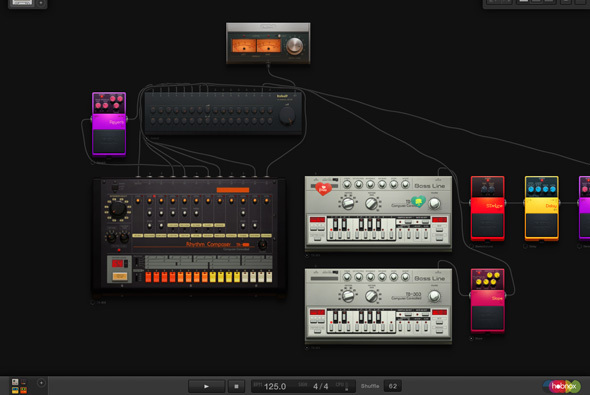 It works really nicely and feels quite tactile, apart form that it is executed nicely with nice animations and video. 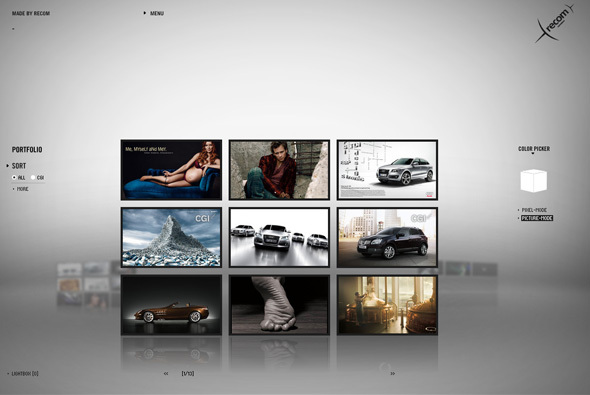 Portfolio site of Polish agency Final Art New Media. Interesting way of showing work, again a 3D interface where you find yourself inside and amongst the work, where you can view stills / watch videos of their work. Each category are in different stacks of images which you float between to see the different categories, which gives the site a nice depth and fun interactivity. Created by Jung Von Matt/Neckar. Self proclaimed as the ‘first-ever choice-making community’, the site poses questions to you, then displays how others have answered. Run by ‘The Colorado State Tobacco Education & Prevention Partnership’ to help young people form their own opinions and encourage better decisions about tobacco. 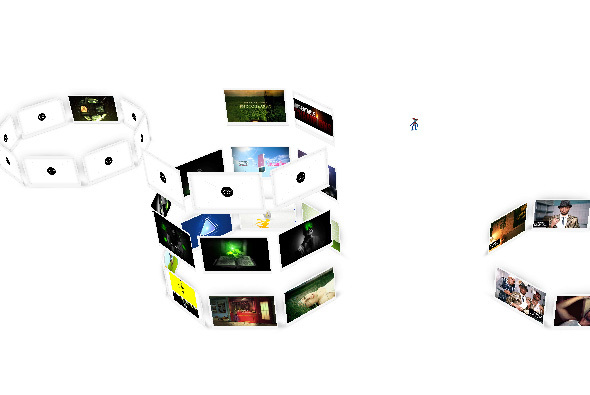 Presented in a really nice way, in 3D space! with floating responses waiting to form the results of the posed questions. You can also see how your opinions match with other user’s and see comments about each question. It is also possible to narrow results by country, gender, and age – amongst others. 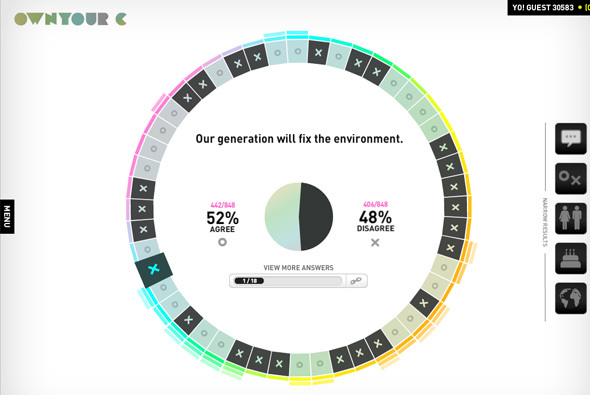 It’s a really nice way of presenting data in a simple, easy to narrow way. 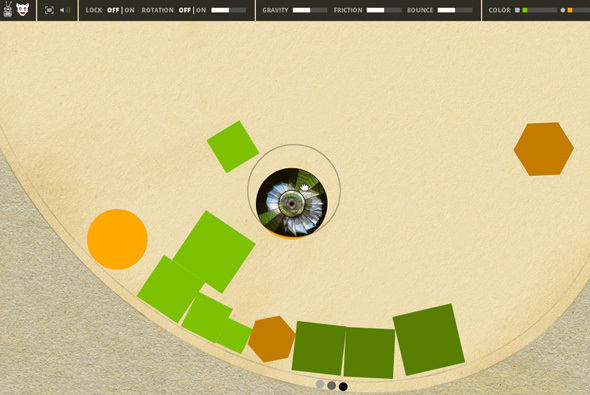 I also like the great use of 3D, really helps to add depth to the site and provide interesting transitions. Interesting site of Fredo Viola – a visual/singer/audio artist. A large rotating shape containing peices of his work collide with each other and can be thrown around and interacted with. The works can then be seen by dragging into an area where they then expand. Really interesting way of navigation! You can even control the gravity, rotation, bounce etc of the world they occupy. 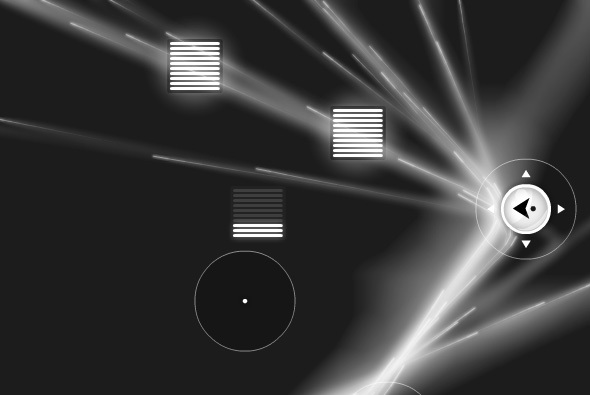 Interesting game where you direct particles to fill sound bars – making a nice melody along the way. Variety of different levels, nice idea which is crafted well in Flash. Website promoting nVidia graphics cards & processors. 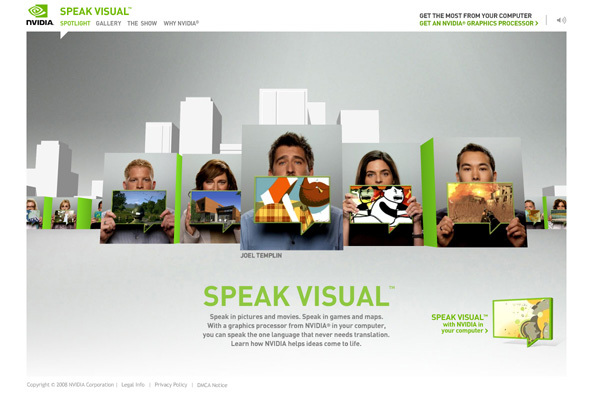 Presented in a 3D interface, you can see nVidia user’s perspectives and thoughts about using their products. (Even Joshua Davies is in there!!) There is also a 3D gallery of images from user’s the world over. I like the way they have used 3D to give a great sense of depth to the site, they often break the frame of the site to give an even more pronounced effect. Throughout is a realistic sense of light and shade with polished animations, layout and typography. Made by Odopod & Cutwater. 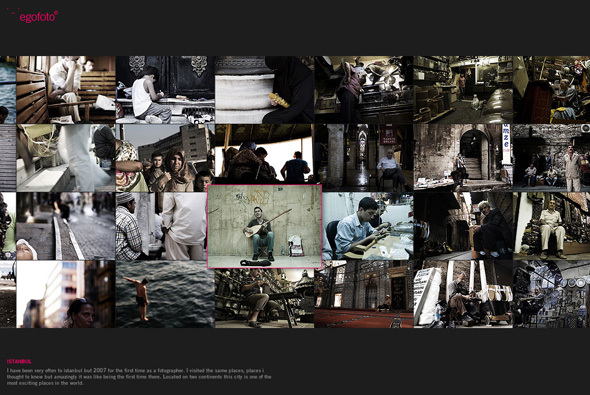 Website of awesome agency B-Reel, one of the heros of 2008. Aside from creating ground breaking work they also have a great website. I like the way the have organised their projects in a vertical scrolling thumbnail mechanism. I also admire the simple layout they have used whilst viewing a project. Simple, clean, easy to use and looks great! Their showreel is also damn cool. Website promoting the female vocal artist Dido and her new album ‘Safe Trip Home’. Featuring film director’s videos that are inspired by the idea ‘what home means to them’, they accompany selected songs from the album – the audience can also respond with their opinions which then float around the globe and when you are looking at specific videos. 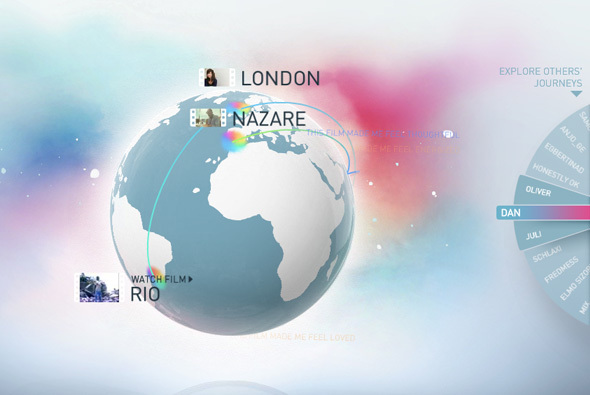 Navigated by dragging around a 3D globe and viewing the various videos. Created by B-Reel and Work Club.